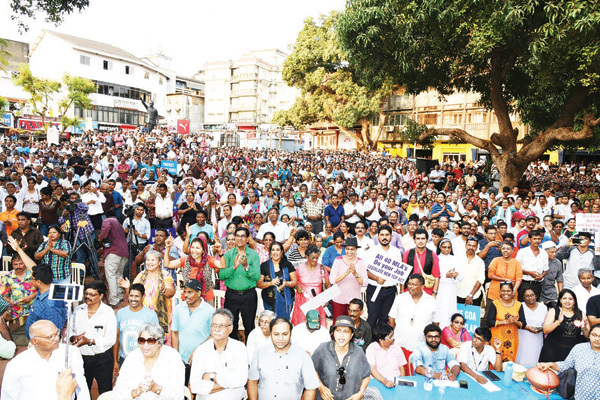 Hundreds of civil society members protested on April 27 at the historical Lohia Maidan in Margao against the creation of Planning and Development Authorities (PDAs) and the decision to revive the Regional Plan 2021, demanding that both these concepts be scrapped immediately. This was the second such massive protest within a span of just 20 days. The first was held in the Capital city on April 6. The demands of the village groups are unequivocal: bin the newly created GPPDA; withdraw the PDAs’ jurisdiction over villages; amend the Town and Country Planning Act and junk the Regional Plan 2021. The entire movement that got momentum post formation of the Greater Panjim Planning and Development Area (GPPDA) the brainchild of Town and Country Planning (TCP) Minister Vijai Sardesai; seconded by Chief Minister Manohar Parrikar to facilitate their new friend Atanasio Monserrate, is something new for the first-time Minister Sardesai. And more so, in absence of Parrikar, his cabinet colleague, Vijai finds himself on the back foot to deal with such large-scale people’s protest galvanized against him. It was appreciating that soon it became apparent that the rumble in the villages brought under the jurisdiction of the GPPDAs wasn’t going to blow over, and Sardesai made the dramatic Easter eve gesture of pulling out all the villages from St Cruz and St Andre from the PDA. These were the two villages from where the movement started. But sadly for the town and country planning minister, his grand gesture was rebuffed with protest spreading across the State. After initially sharing dais for some of the major anti-Government protests like river nationalisation, coal pollution, declassification of coconut, Sardesai, now in the ruling dispension, is facing music of his own politics. Moreover, with Manohar Parrikar, known for displaying splendid political moves for handling such situation since 2012, not being around; helpless Sardesai is left all alone to fight out against the public. The chief minister, who is ailing since mid-February, is currently undergoing treatment for pancreatic aliment in the US for the last two months. And ever since then, wheels of public disaffection against the PDAs notorious for corruption as claimed by the activists has picked up pace. What is even more interesting is that none of the Goa Forward Party’s partners have jumped to their colleague Sardesai’s defence. The coalition partners BJP and MGP too have distanced themselves from the entire controversy in a bid to deliver their bragging partner a reality check. His Cabinet Advisory Committee (CAC) associates Francis D’Souza (BJP) and Ramakrishna ‘Sudin’ Dhavalikar (MGP) are also quiet on the subject. No doubt, Dhavalikar, whose equations with Sardesai have always been bitter, is enjoying the entire controversy from far. Ground reality also speaks that this is the price Sardesai has to pay for hogging the political limelight and arm-twisting one’s coalition brotherhood; none of the GF’s partners have jumped to Sardesai’s defence now that he faces the outcome of his own soaring ambitions. Untangling himself from the people’s confrontation might prove tricky for every politician and Sardesai is not an exception. “PDAs are not created by me. They are there since 2006 as per the Town and Country Planning Act. I had just constituted GPPDA as a political obligation. And following request from the villagers, I had even announced to remove those villages from the planning area. So why this protest now? Looks like it is not anti-PDA but anti-Vijai movement,” Sardesai reacted while speaking to HERALD. While Sardesai prefers to maintain a silence over the very fact that he misses Parrikar’s absence desperately at this point of time, his close aides and political experts admit that the Minister is grappling to handle the situation, which is set to intensify in days to come. “For last two weeks, Sardesai is calling Chief Minister almost on daily basis on the issue. This is something very new to the Minister. He has never handled such pressure situation even in the past. And everyone knows, that only Manohar Parrikar can get Sardesai out of this situation,” sources said. It is learnt that Parrikar tried to pacify the desperate Minister by directing him to ignore to all that is happening. “Minister was told by Chief Minister not to react to anything. ‘Just ignore and let the things happen the way they are taking shape. Everything will die down in few days. ‘Though the Minister agreed to the advice, you know our Minister, he can’t keep ignoring anything for long,” sources said. BJP senior Minister Francis D’Souza said that the entire protest is not against government but specific to TCP Minister only. He, however, expressed his willingness to provide all help and guidance to Sardesai in the matter, as D’Souza was handling TCP portfolio earlier. “We are not in the controversy as the people are not attacking the government but people are attacking only TCP Minister. He has to defend himself all alone. They are targeting him and I feel the entire movement is political and nothing specific to planning,” D’Souza said. “If Sardesai wants, I am ready to provide him all the guidance as I have been TCP Minister in the past. Let him come and ask for help,” he added. The church’s open support to the campaign is also a worrying concern for a politician who banked on the ‘minority’ vote, and whose pre-2017 poll rhetoric was shaped around a ‘secular’ image. Also the anti-PDA movement has now reached in his backyard. “I have high regards for the church. Expect it to mediate to facilitate dialogue to ensure planned development of Goa. Feel bad when one of its heavily politicised organs opts for confrontation,” Minister reacted.